Froggys Swamp Fog Juice is a water based fog machine fluid formulated to create an extremely long lasting / super long hang time fog. The product is currently being used by thousands of theme parks, haunted attractions, amusement ride operators, laser tags, skating rinks, family entertainment centers, nightclubs and in many more places. If you want an extremely long lasting fog with great dispersion properties, and does not have an obnoxious odor this is it. 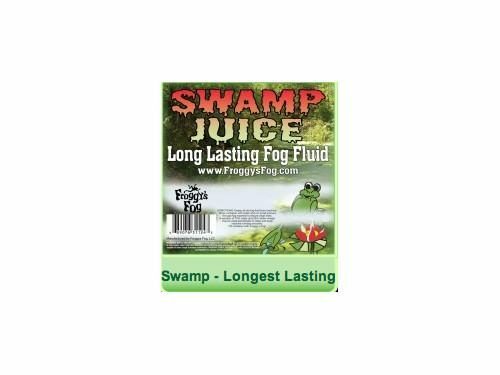 Froggys Swamp Fog Juice can be used in any water based fog machine. It is made from the highest quality pharmaceutical grade chemicals and with the amazing results you will see from this fluid. All Froggys Fog and Haze Fluids are made from lab-grade UV-Filtered de-ionized water and pharmaceutical grade chemicals, each approved by the FDA.